Anglesey has become the first county in the UK to be awarded 'plastic free' community status by a marine conservation group. Surfers Against Sewage (SAS) said it recognised work to reduce the impact of single-use plastic on the environment. It has seen businesses encouraged to ditch disposable coffee cups and bottles, and schools pledging to cut plastic waste. The campaign has also been unanimously back by the island's county council. It follows an 18-month campaign led by local activist Sian Sykes to highlight the issue of disposable plastic waste. "I am incredibly proud of the Anglesey community who have supported the single use plastic free movement, we are making a difference and I am excited to see what else we can do on the island," said Sian. 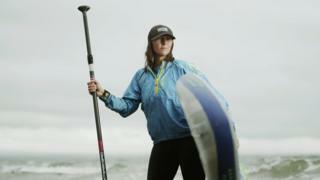 In a personal crusade against plastic pollution in rivers and seas, she highlighted the problem by becoming the first person to paddleboard around Wales - picking-up plastic litter along the way. To achieve the SAS recognition, the island had to implement a plan to cut plastic use, including establishing a community-led group to spread the message. It saw the group reach out to shops, restaurants, cafes, offices and schools, asking them to switch from using throw-away plastic to sustainable products - simple changes such as switching plastic cutlery for wooden knives and forks. More than 30 schools and community bodies have held sessions on cutting down on single-use plastics, with diverse groups ranging from young farmers to scouts signing-up to reduce their reliance on plastic. The council's backing was also a key part of the action plan, with a motion brought by Dafydd Rhys Thomas given overwhelming support. The Ynys Gybi councillor said the move was prompted by witnessing at first hand the dramatic impact plastic waste can have on wildlife. "I saw a seal which was struggling with a plastic bag in its mouth. It struggled and struggled, and after about ten minutes it disappeared from view. Obviously, the plastic bag had killed this seal," he said. "I thought I needed to do something myself for this beautiful island and for out coast." At the Surf Cafe in Rhosneigr, the regular customers and holidaymakers may not notice - but there has been an environmental revolution taking place right in front of their eyes. The disposable coffee cups have gone, along with the plastic straws. The take-away cutlery is now wooden. Plastic pots and bottles are being replaced by glass. The reward? It has been named the island's very first plastic-free champion business, with a wooden plaque - of course - and a certificate to show for the effort. "To me - it's more about the awareness," said owner Dave Buckland. "For years, people have had plastic bottles, plastic straws - they use things that they don't realise are killing the planet, if you like. "When you become more aware of it, and you see other people using them, you think 'we need to stop that'." The cafe's owner admits its taken time to make the changes in his own business, running down the plastic stock and replacing it with sustainable alternatives. It has also meant some extra expense. But the businessman - known to most as Bucky in this surfing seaside town - said he believed it made long term commercial sense - as well as helping the environment. "I think you have to afford to do it," is his advice to other businesses on the island. "They have to spend the money. It costs a little bit more to get the (plastic-free) status, but as time goes by the money will be well spent, and those prices will come down." Single-use plastics are seen as a leading factor in plastic pollution found in rivers and the sea. One study has suggested that a third of fish caught off parts of the British coast contain microplastics - with one estimate that the average seafood consumer in the UK has eaten 11,000 plastic particles in the last year. Rachel Yates, who is the SAS project officer for plastic-free status, said Anglesey's achievement reflected its commitment to improving the environment. "It's great to see the work that Anglesey county has done to reduce the availability of avoidable plastics, raise awareness and encourage people to refill and reuse," she said.